What are some of the most common legal issues that small businesses face? Topics discussed in the webinar will include how to avoid potential lawsuits from investors, partners, employees, and competitors. Plus we’ll discuss employment contracts, managing legal documents, free legal resources for your business, and more. Join us! Register now. 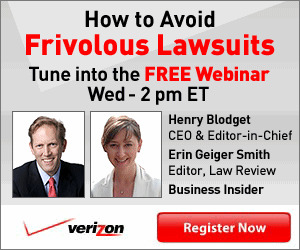 The webinar is one in a series from Verizon’s Small Business centre. See a schedule and archived webinars. You’ll find more useful advice on Verizon’s Small Business Blog, including tips on social networking, marketing, and relevant products and services from Verizon.Find out more about Sponsor Posts.